It has been a while since my last post. There is not much happening on the bee front. Today was the annual Christmas Bird Count http://www.audubon.org/Bird/cbc put on by the Audubon Society. I have been doing this for around 15 years. I watch my feeders all day and get a count on birds that I see. Obviously birds come and go all day. I count the greatest number of them I see through out the day. This recipe has been a favorite at our extracting demonstrations. A very tasty honey cookie. This time of year I like to make creamed honey for holiday gifts to my friends and relatives. Creamed honey is a surprise to many people because they have never had it before. Making creamed honey is very simple. All you need is creamed honey from the grocery store for seed. This is how I make it. I buy one pound tubs of Sioux Bee Creamed Honey at the grocery store. I am partial to this brand as it seems to produce the best creamed honey. Mix 1 pound of seed for every ten pounds of honey. Warm up liquid non crystallized honey. If the honey has crystallization in it the result may be grainy tasting honey. I warm it up to 95 degrees F. Then put it in a bottling pail. Stir in the creamed honey, make sure it gets spread throughout the honey. Try not to stir in air, that produces foam on top. Let cool, the quicker the better. I usually set it outside to cool for a while so the seed doesn't liquefy. After it cools a bit bring it in, keep at room temperature and let it set for a day. The next day I stir again trying not to incorporate air into the mixture. Let set for the day so the air can rise out. Bottle the same as honey. Use wide mouth jars a knife is needed to spread the creamed honey. I use glass hex jars. Let the mixture set in cool temperatures, do not freeze. Honey granulates the best at 57 degrees F. Creamed honey is granulated honey. By adding the proper sized seed the granulation that takes place is controlled to a fine texture. It will take about 7 - 10 days for the mixture to set up. I try to fill at least one plastic tub of creamed honey. Then I can squeeze the sides to tell when it is set properly. The sides won't give when it is set. Variations can be made such as adding powdered cinnamon. Bees on top in November is bad. This usually means not enough food. I take one sheet of wax paper and lay it across the top bars of the top box. Put a 1x2 frame ( a sugar shim ) that will fit the box. Notice the wax paper does not cover all the frames. The bees need access. I cover the wax paper with granulated sugar. Heaping it up the sides of the wood shim. The bees will move up and eat the sugar if needed. They will also shred the wax paper. Checking this monthly with a lit smoker, more wax paper and sugar. Working quickly, this can be done anytime in the winter. I don't want to bury the bees under wax paper when they start using the sugar. Trimming the wax paper may be required. Cover the sugar shim with the inner cover and moisture board. The black cardboard cover top entrance hole will have to be readjusted to accommodate the increased height of the sugar shim. I have a colony that does not have enough food. It has about 6 frames of honey. I know I should let it go but I will try to see if it can make it. When I opened it I saw the bees under the inner cover. I know the bees should be in the lower box right now. They will move up into the upper box in January. If the bees are in the top box now it usually means they are short on stores and will starve during the winter. I will put on granulated sugar to give them a chance. Granulated sugar in not a nectar flow to the bees. They will not raise brood while eating it. Sugar water is a nectar flow and produces brood production. I want this in March not November. The sugar goes on now and I will check it monthly to keep it full. This technique works in late winter for a starving colony. A beekeeper could do this now on any colony with normal stores. Checking on it in early Feb. It the bees have used it add more. If they never use it, take it off the hive and make sugar water in March. The weather is changing and I am going to put in my entrance reducers. The colder weather will bring in the mice looking for a place to keep warm. I put the entrance reducers in with the widest opening facing up. This will prevent debris that builds up through out the winter from blocking the lower entrance. I am not covering my hives yet. I usually do this around Thanksgiving or if it is about to snow heavily. The bees have been busy even in Oct. The 2008 season got off to a tough start. The cold weather in Feb. caused widespread starvation of overwintering colonies. Those that made it past the cold snap were in most cases pretty good shape. Being they had decent numbers I expected those to build up nicely. Then the package bee delivery accident put beekeeping on hold for most of us. The spring did progress weather wise pretty decent until mid April. The weather was cold and ugly until almost June. Package bees installed in mid April had a tough time getting going, some didn't make it at all. My package bees that came in late April then again the first week of May had a tough time fighting the cold weather. 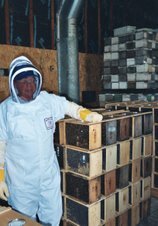 Package bees could not build up with the cold temps and brood rearing was hampered affecting colony population. Pollen and nectar production was delayed. The season seemed about three weeks behind. Over wintered colonies did not build up well at all. Failure to provide pollen patties by beekeepers aggravated this situation even more. Overwintered hives that had the population and pollen did expand ok. But with the season being off by three weeks reports of swarming were coming in. Peak population when there is no nectar caused this problem. The package bees also had their populations suffer. As the weather got warmer there still was no pollen. If the beekeeper stopped providing pollen patties the queen in many cases stopped laying. There again impacting the population. Finally things finally improved around the third week of June. The nectar flow seemed to start in this area around July 10. About three weeks late. My bees by this time were still building up from spring. The plus side, my swarming was minimal, the downside, the bees finally looked nice about the first of August. My honey production was down a bit but better than I expected. The late spring seemed to benefit the late package bee delivery salvaging the season. Bees that did build up early had swarming issues. Reports from other beekeepers was mixed. Some say this was their best year ever. Others no excess honey. If the Basswood flow is a normal source of honey for some, they were left empty handed because the Basswood flow was slim to none. Going into fall now populations seem good. The late flows seemed to fill up my colonies for winter stores. What I need to winter a colony of bees. To bring a hive though winter we need the hive set up as follows. At least 8 frames of adhering bees. Meaning there should be bees covering both sides of at least 8 frames. A young queen that has not gone through a winter yet. Bees that are as mite free as possible. The hive should have been fed 2 gallons of syrup treated with Fumigilan. The top box should have 8 full frames of honey and one partially full. The partial should be located in the middle of the top box. Do not put a partially filled super on top of the full deep box of honey. The bees may move up into the top deep then, move up into the super. The bees will starve even though the deep below still has honey. Bees will not move down to get to honey in the winter. If you don't have enough honey the choices are, add a candy board on top of the hive or add granulated sugar on top of the hive. See how I did this on my last January 2007 post. A top entrance is required so the bees can go on cleansing flights during the winter. If you have a screened bottom board, the slide drawer should be in. The entrance reducer is in now to keep out mice. The large opening is installed upside down. It is upside down to keep the entrance open as hive debris collects on the bottom board throughout the winter. A moisture release board is put on top of the inner cover. Black cardboard winter cover is put over the top of the hive. A hole is cut where the upper entrance is located. One of the top flaps is folded down against the back of the hive. The other 3 flaps are folded over on top of the moisture board. 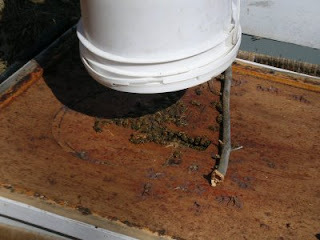 This is very important, This is done to vent the moisture board and get rid of moisture buildup in the hive. A cardboard cover will cover two deep hive bodies. If you have 3 deeps, the bottom box will not be covered. This is not a problem. Cover the box with the telescoping cover. This will not fit over the winter cover. Rest the telescoping cover on top of the cardboard cover and place a rock or brick on top of it to hold it down. I cover my hives around Thanksgiving weekend, sooner if we are going to get dumped on with snow. Don't over insulate the hive. This can cause an early demise of the hive. If the hive is to warm the bees may start rearing brood and run out of food. A wind break is helpful on the north and west side of the hive. If the hives are in the open with no protection from winter winds. Stacking hay bales around these sides can be beneficial. At the end of my video I mistakenly called the Telescoping Cover the moisture board. Steven Speilberg would be disappointed. Click on the arrow to run video. Adding a feeder pail. If the hive isn't level I grab a stick to level out the pail. I have been trying to finish up. I have fed some fumigilan treated syrup, The Apiguard is coming off in a couple of my bee yards. The weather has been ideal for this. I see colder weather on the horizon for next week. I know the bees have to be fed syrup in the next 3 days. Waiting to long the bees might not take it. Not much else to do. The honey has been extracted, most of the bees medicated. I have two bee yards I couldn't treat with Apiguard. I was to busy to make it happen. I guess formic next spring will have to do. Good news I have not seen the bear. Apigard tray on the top bars. Note shim to raise the roof. So the bees can get to the Thymol gel. Put the inner and telescoping cover on to close up the hive. The weather the rest of the week looks perfect. As Sept moves forward the window for using mite treatments is closing. Apigard needs warm weather to be effective, This week could be the last hurrah for this. Apigard is a Thymol gel in a foil tray. First take off all honey that will be extracted. Read and follow all directions. Apigard is a fall treatment only. Remove the foil top and place on the top bars in the top box. Put a 1 x 2 shim on the top box to raise the roof an 1 - 1/2" so the bees can remove the thymol gel. Close all entrances, put in the drawer on any screened bottom boards. Leave the main entrance open. One foil tray is on for two weeks then one more two weeks later. Apigard kills Varroa and Tracheal mites. I had the evil eye put on me. This picture is fairly intimidating. It must be the bear or a werewolf. I have my camera at about 5 ft 6 in. off the ground. A deer isn't that tall. It has to be the bear. I set my camera to take 3 pictures, this was the set all taken in one minute. He must be standing up looking at the infrared flash. Bears hate trail cameras and usually trash them. This is a pail heater. This type of heater is not to be used in honey. The shielded end keeps it away from the pail. I make sure the heating element is totally submerged in syrup. Pushing it into the granulation it will heat up quickly. I never leave it unattended while it is heating. I use a drywall mixer on a drill motor to stir it. This mixer also works great for mixing sugar and water in a 5 gallon pail. When I add fumigillan to syrup this works great for mixing it in. I have to feed my bees. All my HFCS high fructose corn syrup has granulated since spring. I use my bucket heater to liquefy the syrup. The heater in the pail took about 2 hours to liquefy stirring it a couple times. This heater is not to be used on honey as it is not approved to use with food. The puncture pail opening method works best for bears. The bear wanted some bee supplies. I finally got a picture of this troublemaker. He ate a 5 gallon pail of Bee Feed without even taking the lid off. He used the incisor puncture method. I am sure he was very satisfied with that. This was 20 yds from my back door. I know with the cooler temps it is time to pull all my honey and get the meds on. Labor day was hot and I pulled about 75 supers off. The hot day made the honey robber on fume boards work great. I brought home a very small number of bees. I will start putting on fumigillan now in syrup and treating for Varroa. Any colony that didn't produce and seems to be dwindling could possibly have Nosema Cerane. The fumigillan should be able to clear this up. Hopefully the bees have time to recover. Feeding early is better than feeding late. Feeding promotes brood production. I want the bees to slow the brood rearing as fall deepens and it gets colder. This will save more food for winter. This is how the frames looked when I pulled the super. I used a stainless comb cutter to cut out the comb. Note the brown propolis on the end bars and on the edge of the top bars.. The bees put propolis wherever there is a crack. The comb is placed on a cookie cooling rack with a pan underneath to drip for 24 hours. I put three cut comb frames with thin surplus foundation on when the nectar flow was going. They fit in a medium super. My colonies produced three frames of cut comb that I put on in mid July. They were not full, but there was some comb. I pulled the supers using Honey Robber and a fume board. 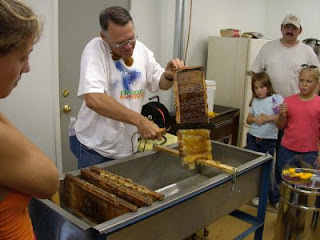 The comb honey frames were pulled. I set a frame on a cutting board. I used a serrated knife to cut the comb off of the frame. Taking the 3-7/8" comb cutter from a pan of hot water. I wipe off the water then cut through the comb. Cleaning the cutter off after every cut. The comb is placed on a cooling rack above a cookie sheet to drip for 24 hours. The next day I put them in clam shell containers. This is the easiest type of comb honey to make. The frames fit in a medium super. The only eqiupment needed is the frames, foundation, comb cutter and clam shells. The extracting workshop went well. 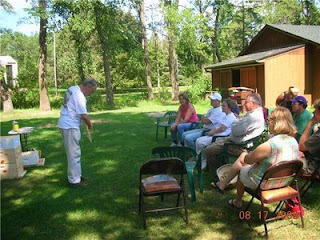 Master Beekeeper Bob Sitko explained methods of pulling honey. He also talked about mite and nosema treatments. Wintering the hive was demonstrated also. 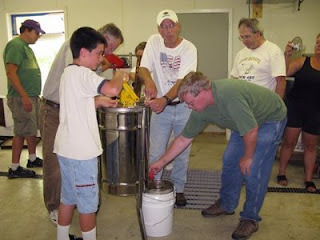 I demonstrated how to uncap, extract, filter and bottle honey. Everyone bottled a jar to take home. Wendy served up some honey crinkle cookies, honey popcorn and honey limeade. My annual extracting workshop will be held on Sunday August 17 at 2 - 4pm. It is free of charge to attend. It will be limited to 50 people. Due to its popularity first time beekeepers only. I am sorry but I have to limit this to folks who have never been here before. My disclaimer: Caution should be taken as there can be bees flying around and bee stings can and will happen. This is a hands on demonstration and everyone is welcome to try out the equipment. The bear has returned. He is causing a ruckus in the neighborhood. Tipping over garbage cans, tipping over some empty bee boxes. The electric fence has kept him at bay. This is the time of year when bears are a big problem. The mating season of black bears is coming soon. Young bears get chased off by their mothers and other dominant bears, they must establish a new area for their own. An area that has not had bears but is near possible bear areas is prime for these young bears. They will do some traveling and feed at bird feeders and an occasional beehive leaving carnage in its wake. Not having an electric fence is asking for trouble. The bear will wreck the hives then the fence goes up and new beehives must be purchased. Put the fence up before the bear hits. There has been a decent nectar flow going around the state finally. Some areas it is coming in large quantities. It is advisable to check supers to see if they are full. I have heard from some folks that the have more than 6 supers full and will be needing a ladder if they add any more. Caution must be made to stay ahead of the bees so they don't plug up the brood boxes. If the supers are getting to high it helps to throw some of the full ones on a weaker colony so the ladder can be left at home. But beekeepers love the photo-op of a colony with 8 or 10 supers on it. I fit this group as well. This nectar flow may last a while yet. The late spring has definitely made for a late flow. The slow build up of colonies because of the cold has been helped greatly by the late flow. 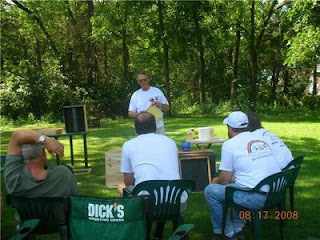 I attended the MN Honey Producers summer meeting in St Cloud on Friday. There were several speakers talking about bee nutrition, residue from a pesticide called Imidichloropid, and information about nosema ceranae. Beekeepers at the meeting all seemed to be having a poor nectar flow up to this point. They are hoping the late spring has moved the nectar flow back and that it will pick up in the very near future. Imidichloropid's are a nicotine based pesticides widely used in landscape plantings and many other Agriculture products. As beekeepers what we are concerned about is residual pesticide that are possibly winding up in the nectar of some flower bearing plants. Are these compounds part of the CCD debate? More data is needed. France has done some research on these compounds. The reader should look at their findings and make your own conclusions. Nosema Cerane is a mid gut disease that can cause the death of a colony of bees. 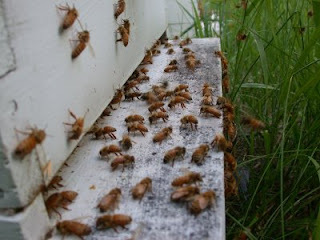 Most beekeepers are familiar with Nosema Apis which usually shows up in spring then will go away by late May early June. It is time predictable when we would see this condition. Nosema Apis usually would hit Northern beekeepers, Southern beekeepers usually never would never get this disease. Nosema Cerane on the other hand can strike at any time of the year. North or South. This condition has rapidly spread throughout The U.S. Possibly a cause of CCD. It affects older bees and will kill infected bees in 8 days. Larvae and younger bees don't get it until later in their life. Once a bee gets this they usually can't recover. This disease will cause a strong colony to dwindle down, getting weaker with time. Nosema Apis is very obvious if a colony has it. 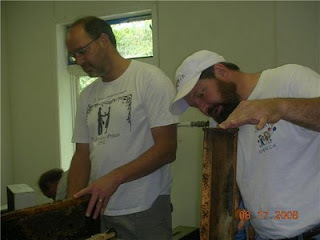 Nosema Cerane can be diagnosed using a sample of forager bees and a procedure to look at the sample under a microscope looking for a spore count. While most beekeepers do not have a microscope, looking for colonies that are showing symptoms possibly should be treated with Fumigilan-B. Both Nosema Apis and Nosema Cerane respond well to treatment with Fumigilan-B. Follow the manufacturers information on the label for application. This is a picture of the hive beetle trap. Some assembled some not. Hive beetle trap in the hive. I did have some hive beetle in some of my hives. I saw them in a couple of weak colonies. They were not reproducing. I didn't see any active beetle larvae. As a precaution I put in some beetle traps. These are narrow plastic troughs with a plastic screen that snaps on. The troughs are filled with Apple Cider Vinegar. The beetles are always getting harassed by the bees and like to hide. When they hide in these they will fall in and drown. The troughs are narrow and fit between the frames, the screens hold the troughs in place. I can tell this box needed more supers. The white new comb is covering every frame. Each frame has honey in it. More supers are needed now to stay ahead of the bees. If there is comb honey in any super boxes grass is needed in the spout of the smoker. This keeps charcoal bits from the smoker getting on the comb honey. I looked at all of my hives today. Added supers as needed. Some had two supers full, some were just getting into the first super. I have heard varied reports of some beekeepers have two to four full supers. While others are just at the point of putting on there first supers. The nectar seems to be coming in ok.
Hives with the bigger populations are leading the race. A standard medium frame. Note wooded wedge I have broken off the top bar. After the foundation is inserted the wedge is positioned to anchor the foundation. Notice the thin strip of foundation I trimmed off so the foundation would fit proper. A stapler is one method to attach the wedge strip. 5/8" nails work as well. The cut comb frames are put in the box closest to the queen excluder. I have marked the frames with a marker. When the combs are all capped they all look the same. Obviously these are new and can easily be spotted. But as time goes by the frames will darken then the marking will be important. I have a nectar flow going at my place in Stillwater. When I know I have a flow going and the bees are putting up nectar into the supers, it is time for cut comb honey. Cut comb honey is probably the easiest comb honey there is to make. Nothing special except a few frames and thin surplus foundation. I use a medium super on my strongest colonies to make cut comb honey. Starting with medium frames with wedge top bars. Assembly for the frames are the same as any frame, nails and glue. The wedge is a cut piece of wood on the top bar. There are two types of top bars, grooved and wedge. I break the narrow wedge off the top bars before assembly. After I glue and nail the the frame together I run my pocket knife across the top bar to take off any extra wood left by the wedge. This makes for a smooth top bar and nothing can get hung up on it. The next step is to insert the thin surplus foundation. This foundation is 100% beeswax and is edible. Insert the beeswax foundation into the groove of the bottom bar and gently push it against the edge of the top bar. If the foundation fits too tight slight trimming may be necessary. The foundation should hang straight with no bulges or waves. Take the wedge and push it tight against the top bar, pinching the foundation. This will hold the foundation in the frame while the bees are drawing it out. Nail or staple the wedge in place. 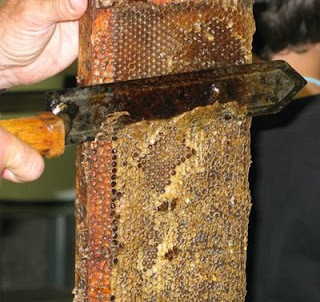 When the bees have finished the frame of comb honey the wedge can be removed and new foundation can be reinserted repeating the process. I always use the strongest colonies to make comb honey. Taking the supers off I put the frames about in the center of the super right above the queen excluder. Using weak colonies or putting the frames on to early sometimes leads to the bees chewing holes in the foundation instead. I will recheck it in a week to see if it is finished. When checking the comb honey, always stick green grass in the end of the smoker spout. This will act as a filter to prevent bits of black charcoal from getting all over the new white comb. I made this mistake when I first started keeping bees. I didn't think I would get any honey the first year so I didn't think I needed to put on honey supers. What a mistake. The bees collected so much honey that the brood nest was plugged solid. The queen had no place to lay. The hive dwindled and didn't survive the winter. Now I make sure all of my colonies have honey supers on. A hive can put up so much honey in a short time that if it is not checked at least weekly can plug up the brood nest also. I always am two supers ahead. Bees have a hoarding instinct. Beekeepers can exploit this by keeping empty supers ahead of the bees. The bees will work harder to fill this up. If the supers get full, the bees may just stop collecting nectar. Having an empty super on top makes the hive get all the honey that they are able to collect. The weather and the long term forecast is perfect for honey production. Warm days, not hot. Low humidity. Hopefully there will be a good crop.